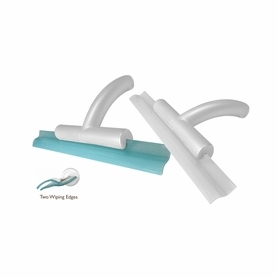 These bath and shower squeegees are for those who may prefer a squeegee with a separate handle or do not need the added features of the Contemporary model. Available with a 9 or 12 inch wiping blade, they will provide superb results used on any flat surface. The two versions offered are functionally identical. The differences are aesthetic and in the materials used.